"There is a way to be good again." 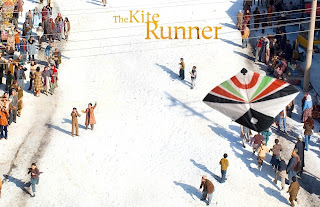 Directed by Mark Forster (Monsters Ball, Finding Neverland & Upcoming: James Bond), The Kite Runner is adapted from Khaled Hosseini's best selling book of the same name. 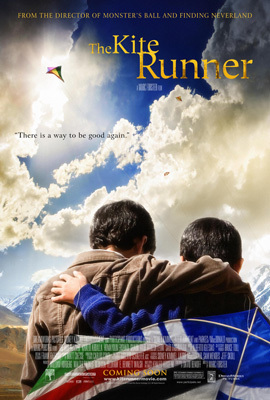 "-just saw the ‘kite runner’ at the flicks … very sad film, and yet hopeful & uplifting in that bittersweet way - think i’m easily played emotionally, push the right buttons and all of a sudden the air is filled with grit and it’s slipped annoyingly into my eyes again." O'DB in a comment on the film at the site Go!Smellthe Flowers. The film has had mixed reviews, but I was determined to see it. So last night I stocked up on my extra large popcorn and coke and settled down to watch it. It made me fight back a swell of tears. It made my wife cry. And listen, you can pick holes, but when a film reaches out from the screen and connects with me, then it is job done as far as I am concerned. The marvel of it is that it can do that even though it is culturally as far removed from me as is possible. And there lies the films (and the books) strength. For it communicates against the backdrop of Afghanistan, Soviet invasions and the terror of the Taliban, universal themes of friendship, love, betrayal and redemption. And the cherry on top for me? Well, I loved the book, The Kite Runner, which was semi autobiographical. What I didn't like was the plot twist at the end, which was bolted on by Khaled for fear of the story not standing on its own merit. It's my story, I get to end it how I want. I was hopeful that Sohrab's suicide attempt, which was a false and contrived dramatic ending before the true one, would not be in the film. I see the rest of my life. I piss on the beards of those self-righteous monkeys. Hassan stoops to pick up a pomegranate. He walks to Amir, tearing the fruit open in his hands. Hassan crushes the pomegranate against his own forehead. Juice drips down his face. He turns and walks away from Amir, down the hill. Amir stares after him, tears filling his eyes. I liked the fact that the Afghanistan bits were in Dari (at the insistence of director Mark Forster). But when the subtitles showed off screen dialogue, like the boys shouting as they raced to get their kites, it jarred and wasn't needed as the images portrayed what was going on. And in the first third of the film in Afghanistan, I thought the cinematography and screenplay could have been more atmospheric and less like watching a TV drama. Problems for the child actors, who had to leave Afghanistan fearing for their safety over this scene: "Hassan doesn't struggle. Doesn't whimper. His face is blank." Screen Writer, David Benioff Interview. Read my review of Khaled Hosseini's second book, A Thousand Splendid Suns. Tis on our list for sure! Thanks, now Go! Fly your Kite. Always tricky with a book you love, but in this case you should be safe! Let me know what you think. Mike, your review has got Bridget hooked on both the movie and the book! Definitely on her list this year. Bridget Jones: Hiya my Flower pal, great stuff, hope you enjoy! Stella: And when you have finished that, try A Thousand Splendid Suns by the same author. "I only hope the movie was faithful to the protaganist's somewhat jealous and ultimately guilty narrative." I think it did mate. I heard Chris Evans (Radio2 DJ in the UK) who is famous over here, tell about how when he went to see a film last year in the afternoon, he had someone making a noise in front of him as he was trying to watch. "I don't normally say anything, but I leant forward and shushed him. His reaction was to turn around and to tell me to go F**k off!" So you have a point Mr Grudge!